i´m using TraceTool quite often in .NET-Development and find it very, very useful. Thank you very much for this tool! (remind´s me to Ray Konopkas CodeSite in earlier years). What i´d like to do now is set up Oracle PlSql-Package, that wraps the TraceTool-communication so that it´s easy to send (only) simple messages out of a Oracle-Database to the Client-side Viewer. Unfortunately, i can not find any Documentation of the TCP-Packages that are sent to the viewer and extracting everything through deep-debug-sessions is a tedious work. But as this is incomplete and it´s hard to analyze-by-debugging the whole stuff, can you please provide a document, that contains informations about how a TCP-message must be set up for this and that command? Is there a version of TraceTool that has been built with .NET Framework 4.7.1? Can I tail log files on over the network on another machine? I've looked at the code a bit, and at the demo project, but could not figure out how can I tail log the files on another machine. Re: Can I tail log files on over the network on another machine? The viewer ask windows to send event when file change. Since the file is another computer, windows cannot detect change. First I think this project is super cool. After playing around for a weekend i was able to create _exactly_ what I wanted using your framework. My goal was to automatically tail log files in various locations on a remote machine and send the changes to the appropriate tabs in the Viewer. I know you have such functionality in the viewer itself, but I needed to tail logs from another machine. It uses very efficient stream reading mechanism to only read the changes of the logs. It also automatically starts to tail the new log file when it's created in monitored directory. I made it as generic as possible, and all parameters (transmit, polling intervals, etc) are loaded from config file. Each log is processed in dedicated Task. Do you think this could be useful for other people? I would be glad to contribute somehow. Even though I only have 2.5 years of c# experience - I think this could be useful for lots of automation engineers. 1) I noticed that when viewer is not launched - logs/traces are still being sent. When I open the viewer later - I see that it received all the logs from the beginning. Is there any way I can limit the queue depth? What if a user just forgot the open Viewer, or forgot to leave the sending deamon app running on the test machine ? Would it collect the logs till memory runs out? Is there any way I can check whether the viewer is running (on specified hostname/ip) so that I could stop sending logs if I detect that viewer is not connected for some time? Or do you propose to try to use UDP protocol for my purpose? 2) Is there any way I can communicate with my sending deamon (running on another machine of course) from the Viewer? I would like to , for instance , to be able to toggle enable/disable logging collection. Of course I understand I could write some WCF or something like that, but is there a way to do it from Viewer through your API? 3) Is there a way to quickly filter only Error/Warning messages in the Viewer? I've looked in the options, but could only find text filter. But I'm already marking the messages appropriately on the sending side info/warning/error. Only Git is up to date. Other buttons seem not to work. It seems i do not understand how it should work. There is no Demo 2007, but a Demo 2009 folder with a DelphiDemo_XE4.dproj project (don't use the other one). Better is to run the viewer before. Would be really helpful if you could include the trace info when saving a trace window to xml file. If not all data, then at least Strings i.e. from call to SendStrings(). When saving to xml, all node informations are saved. I see you are right. Sorry my mistake. When im sending the traces in winTrace with multiColumn option, the viewer don't display the severity icon, even though iv'e sent it with Debug/Warning/Error like in the example in the article. What i need to do to show the icon in multicolomn? this is a very good project / program. Is it true? It is pitty. Re: Project TraceTool is dead? No, not dead at all. Sorry to forgot to read the messages. I just uploaded latest version of c# and delphi api. this is a great tool but the SetLogFile method is not implemented for mode 3, 4 and 5 in Python. Could we have an update ? If setting the logger to Multicolumn mode, then in the viewer it doesn't show the Time or Thread ID columns. I poked around in the viewer source, and found a comment in the Application6.xsd that these columns are not shown in Multi column mode. I opened the log file XML, it has the timestamp in it, so is there a reason for not showing it? And more importantly, can it be displayed. Thanks for a great and powerful logger. Can TraceTool be used in a Windows Service Application? 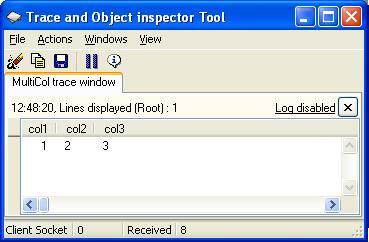 I have tried to use TraceTool.pas in a Windows Service Application (D7). Compiles fine, however no traces are sent to the console. Is there something extra I need to do, or is it something that cannot be done? Re: Can TraceTool be used in a Windows Service Application? Service is a little bit special. 1) the client api that run as a service mode can't start a process. You have to start it manually. 2) you must use socket mode in place of windows message, because your service run in a special environment. Is tracetool suitable for 64-bit applications? How suitable is this tool for C++ applications built for 64-bit architectures? The C++ download only contains 32-bit builds in the sln file, so I am concerned about using this in a mission-critical 64-bit environment. - It does build if I set the compiler to x64, but that is only the first step. - I am more concerned whether it has been tested, and used in such an environment. Re: Is tracetool suitable for 64-bit applications? The viewer work on a 64 bits environment. The protocol to send traces use 32 bits unicode strings. I am sure this work. This tool is great, but I have a little question. This make perfect sense. But this message will be printed for each send() command. In other words, if the viewer is not active, how can I disable the send functionality after the first try?